Surprise, b—h! Bet you thought you’d seen the last of Murder House and Coven. Finally, FX dropped the very first footage from the highly-anticipated American Horror Story crossover, and it’s packed with familiar faces. The eighth season of the horror series finds the ghosts from the freshman season coming face-to-face with the witches of Coven. As the first trailer proves, AHS: Apocalypse is taking its subtitle very literally. “It’s the end of the world,” a voice says, and a plane holding Evan Peters, Joan Collins, and Leslie Grossman begins to crash. And who is that young man with the Devil’s eyes you ask? The Antichrist, baby! 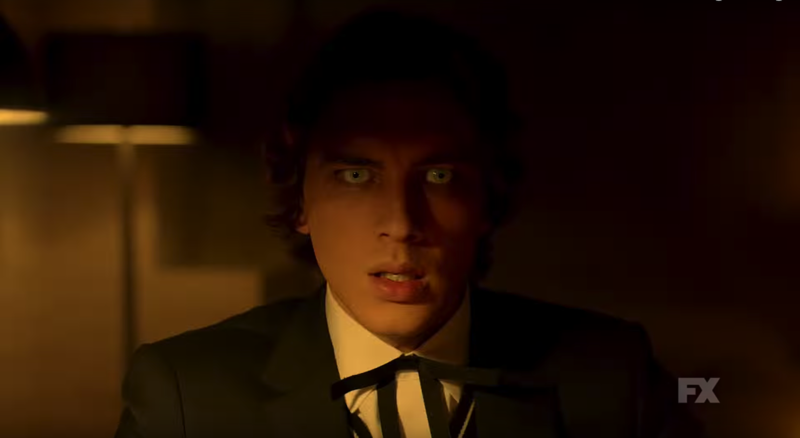 To refresh your memory, Michael is the evil child who was conceived when Tate (Peters) raped Vivien Harmon (Connie Britton) in Season 1 in the Rubber Suit (hey, the Rubber Suit is back too!). Michael then killed Vivien in childbirth, and grew up to murder his nanny. Nice kid! By the looks of his thin black tie and outfit, which shows up elsewhere in the trailer during footage of the returning witches, it looks like Michael is now a student of Miss Robichaux’s witch academy in New Orleans. Exactly what we thought! The brief-but-packed teaser also shows the returns of a bunch of witches, including Sarah Paulson’s Cordelia, Emma Roberts’ Madison Montgomery, Frances Conroy’s Myrtle Snow, and Taissa Farmiga’s Zoe. There’s a look at Billie Lourd’s new character, plus a couple moments with Peters’ new character, who might just be a vampire (or a cannibal?). He’s also reprising his Tate from Murder House, while Paulson is playing three roles this season – Billie Dean Howard, her Supreme Cordelia, and a mystery character named Venable. There’s also a shot of Jessica Lange’s Constance, but don’t get too excited yet; it’s a reused moment from the end of the first season. So what the heck is Apocalypse about? FX has been quiet on plot details, but we know it “begins with the end of the world,” as teased by executive producer Alexis Martin Woodall over the summer. Fans will remember that at the end of Murder House, Billie Dean Howard warned Constance that the birth of a child conceived by a human and a ghost (aka Michael) would usher in the end of days. So some kind of doomsday is on the way. Since this season set roughly 18 months in the future, it’s not quite clear how the crossover situation will work out, and how confusing the whole thing will be with multiple actors playing multiple characters. And technically, that timeframe would make Michael nine years old, and Fern certainly does not look nine. The official Twitter account teases more is coming tomorrow, so we might be getting more details and a full trailer then. AHS: Apocalypse premieres September 12.